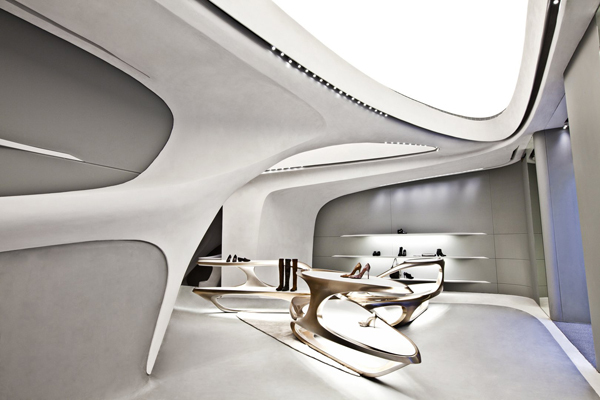 Zaha Hadid Architects competed 3,000 square-foot Stuart Weitzman Flagship store in Milan. It is created in playful dialogue of geometries which further create a rhythm of folds and recesses, shaped by functional considerations. Central design pieces and display units have been designed to showcase the collection while also providing seating. The design creates interior landscape, rooted in monochromatic palette. 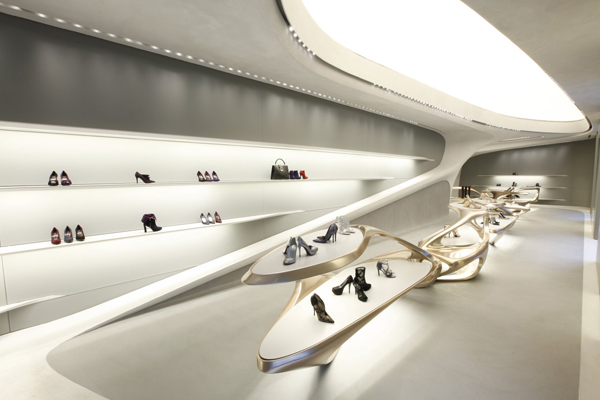 An intricate combination of materials and construction technologies has defined the spatial experience in the store. The modular seating and display elements have been constructed in fiberglass, dipped in rose gold. The store walls and ceilings are made in glass-reinforced concrete, which shows solidity together with precision of complex curvatures, which generate focal points and areas for display. The design concept of the store is divided into variant and adaptive elements. 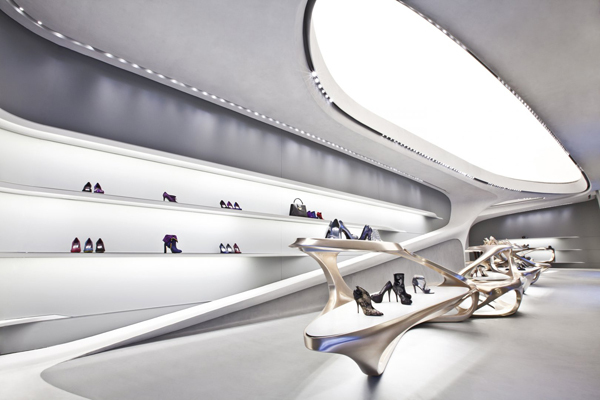 Enabling the design to establish unique relationship within each world-ride location, the space had to be recognized at the same time as Stuart Weitzman store. Additional flagship stores are planned to be strategically located around the world – starting from Hong Kong, Rome and New York. This vivid interior, chic and joyful but shaped after ergonomic needs is a statement design,which offers breathtaking experience to the customer, due to both fashion and architectural pieces. At Stuart Weitzman they state that this was a major new initiative that will help achieve the next phase of growth and raise brand recognition worldwide. 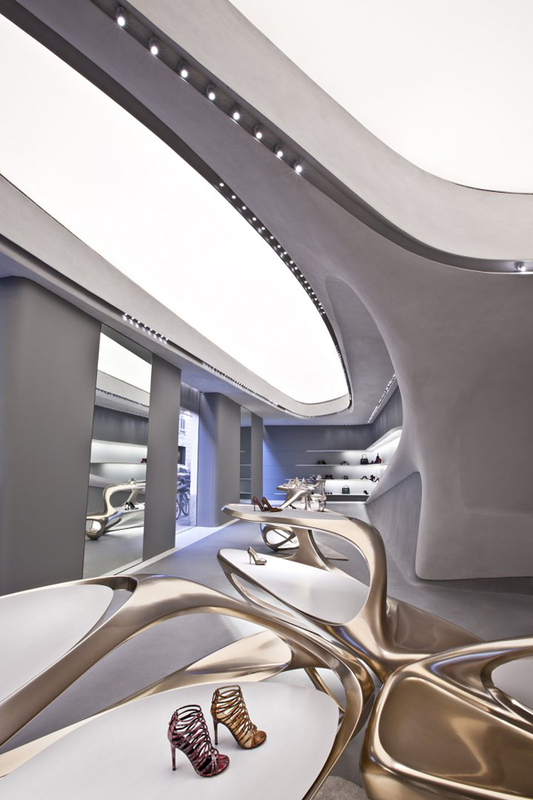 They believe that the marriage of Zaha Hadid’s architecture and the very collection will create one-of-a-kind retail experience.